Trinidad State Junior College offers one of the top five rated gunsmithing programs in the United States, and graduates benefit from the reputation of the school for preparing graduates to handle a number of responsibilities and tasks in the field. Many students who choose to attend Trinidad State Junior College are drawn to the small town, rural environment and the low student to faculty ratio. Instructors take the time to get to know their students and to work with each student one-on-one. As a part of the state collegiate system, Trinidad State is fully accredited and meets all state expectations for higher post-secondary education. As a junior, public college, students at Trinidad State also enjoy benefits such as help with securing financial aid through federal loan and grant programs. In addition, students in all programs at the college, including the gunsmithing program, have the chance to experience collegiate life through participation in extracurricular activities such as sports and academic clubs. The gunsmithing program at Trinidad State Junior College is designed and updated to include courses and skills training in the areas that industry experts identify as essential to becoming a good, professional gunsmith. The curriculum, therefore, focuses on four major areas of study: stockmaking, machine tools operation and safety, firearms customization and finishing, and firearms repair. Within these areas, students learn a number of skills such as hand filing, parts fitting, trigger jobs, firearms safety, firearms function, inletting, glassbedding, and stock finishing. Another benefit of the gunsmithing program at Trinidad State is the opportunity to choose to pursue either an associate of applied science degree or certificate in gunsmithing. The associate degree option requires completion of 72 credits, including several general education courses, and the certificate option requires completion of 57 credits. Students are able to choose the option that best fits future education and career goals. Either way, a graduate can be ready to get to work in a gunsmithing position in as little as two years. Prospective students can also consider the summer program NRA short course in gunsmithing, which is offered at locations including Trinidad State. One of the reasons that the gunsmithing program rates at the top of programs in the U.S. is the curriculum. The required courses in the associate degree program for gunsmithing are designed to get students ready to handle all types of fabrication, finishing, and repair work. Gunsmithing course work in the first semester includes firearms safety and an introductory course to working with firearms. Other major coursework includes gunsmith welding, machining, and bench metal for firearms. In the second semester, students complete courses in repairing firearms and firearms conversion, as well as courses in finishing and duplicating. The third semester includes advanced course work in machining and stockmaking. In the fourth semester, students continue to take advanced courses in stockmaking and repair of firearms, as well as completing an overall comprehensive skills evaluation. Each semester also includes classes in general education. Associate degree students complete courses in workplace skills, composition, basic mathematics, business, accounting, and social sciences. The well-rounded education is beneficial for beginning to prepare to working professionally in the field by building skills in communication, writing, and collaboration. After completing one of the programs at Trinidad State, graduates are ready to obtain a license through the U.S. Bureau of Alcohol, Tobacco, Firearms and Explosives, which requires submission of an application, proof of training and knowledge, and an interview. Once the licensing and certification process is complete, it is time to look for a position or get started operating a business, and the college boasts an 80 percent placement rate. With additional help from career services at the college, graduates of the program are likely to quickly find a position. 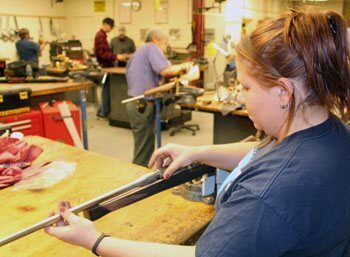 One disadvantage to the program at Trinidad State Junior College is the lack of emphasis on learning business-related tasks, laws, and regulations of gunsmithing. Knowledge of this information is likely to be required for licensing, and it can also be beneficial for starting a business. Additional information on these areas of the field can be found at the Bureau of Alcohol, Tobacco, Firearms and Explosives website on the gunsmithing FAQ page. With any education or training program, there are advantages and disadvantages for every student. At Trinidad State Junior College, the advantages to graduates outweigh the disadvantages, preparing students for the professional world of gunsmithing.